Rash guard sports shirt with the 'Messe Noire' print on the entire surface. Rash guard is an elastic t-shirt and is very tight and fitted to the figure. This is a very popular type of t-shirts among people who go to the gym, train sports like MMA, it is also great for outdoor activities. It protects the skin against abrasions while being airy and perfectly absorbs moisture and puts it away from the body. T-shirt made of high quality material in a basis weight of 180 g / m2 which consists of 92% polyester and 8% elastane. No additional UV protection layer. WARNING! Check the sizes before buying. 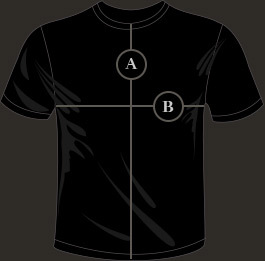 It is different from other our shirts - these are smaller because they are meant to be fitted. If, for example, you wear our M in cotton t-shirts or all-prints (and the are loose fit, not very fitted for you), M rash guard will also fit you- but it will be very tight (that is what it should be in this type of shirt). Please remember, that there is always 1-2 cm (0.4-0.8 in) tolerance in each size. REMEMBER! rasguards are very tight (as a second skin) yet very elastic.